I read this book for the first time after getting it for free at a college orientation fair. While the book pulls together several personal essays about Christian life and knowing God, the movie focuses on a particular section of the book concerning Miller’s experiences at intensely liberal, strictly nonreligious, Reed College in Portland, Oregon. If you have read the book, you may notice that the main connection between the book and the movie is the title. The movie follows a new, fictionalized plot based off of Miller’s real-life story. This means readers of the book may get confused at certain points and say, “Wait a minute. Back up there. That’s not how it goes.” At other points, readers may also flat-out declare, “That never happened!” And they will be right. Consider it a “re-interpretation” of the book more appealing for a movie audience. And it is very appealing. If you have read the book and don’t mind fictional spin-off, the movie is hilarious while dramatic, entertaining while thought-provoking. If you have not read the book, you may wonder what the astronaut has to do with anything or why a rabbit is frequently seen chasing after a female carrot. The symbolism of either Don the astronaut or Don the rabbit may pass over your head. Readers could recognize these, however, as creative additions from the comic strips in Blue Like Jazz that Miller uses to illustrate his stories. 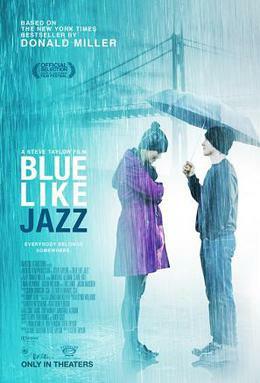 So while the movie did have its start in Blue Like Jazz, don’t skip your reading if you have a book review due for class. Both are thoughtful works of art that should be enjoyed separately, on their own terms. On another note, my enjoyment of Blue Like Jazz and Searching for God Knows What has led me to consider writing my own book that takes after the personal essay style Miller employs so beautifully. I took a Creative Nonfiction Writing class last spring and received much encouragement to continue using that writing style, which somewhat resembles the posts of this blog. We will see where God takes this idea, and in the meantime, I will continue sharing my thoughts here. If anything does come of it, I only hope no one wants to dramatize my life story into a screenplay.